Stubborn fatty tissue that resists the effects of diet and exercise is a major concern for many people. While treatments like liposuction can often be effective solutions, not everyone is open to undergoing an invasive procedure to correct their trouble areas. Fortunately, leading plastic surgeon Dr. A. John Vartanian offers another option to slim, contour, and sculpt the body using noninvasive techniques. Contact us today to find out if SculpSure body and chin contouring is right for you. SculpSure is an FDA-approved body contouring technology that uses laser energy to reduce pockets of fatty tissue below the skin on some of the most difficult-to-tone spots. No surgery, needles, or incisions are needed to achieve fat reduction in the treated area, making this technique a popular choice for individuals who lead healthy lives but struggle to sculpt certain regions of their body. It also involves no downtime and takes 25-minutes per session to complete. What Is the SculpSure® Treatment Like? Using a system of four flat paddles, SculpSure delivers laser energy into the skin of the targeted area to spot-reduce fatty tissue and improve contour. The light-based energy heats the underlying structures to a specific temperature, causing fat cell destruction while leaving surrounding tissues unharmed. The body then naturally removes the affected cells through normal metabolic processes. Patients typically find the experience quick, easy, and nearly painless, thanks to the temperature-controlling cycles of the platform. After about 25 minutes, the treatment is complete and you can return to your regular activities. In addition to sculpting the body, SculpSure can be used to reduce the appearance of submental fatty tissue, commonly called a “double chin.” A special, smaller version of the SculpSure paddles is applied the underside of the chin. Everything else about the treatment is similar to the therapy performed on the body: The procedure completes heating and cooling cycles, breaking down fatty tissues and achieving a firmer, more toned-looking outcome. SculpSure for the chin also takes approximately 25 minutes. What SculpSure® Results Can I Expect? SculpSure gently and gradually results in skin contour changes corresponding with the loss of fat. The results are gradual allowing the skin to shrink for optimal, smooth, and natural looking results. Over the course of about six weeks, you should notice the treated area become flatter as your body absorbs the fatty tissue and removes it. 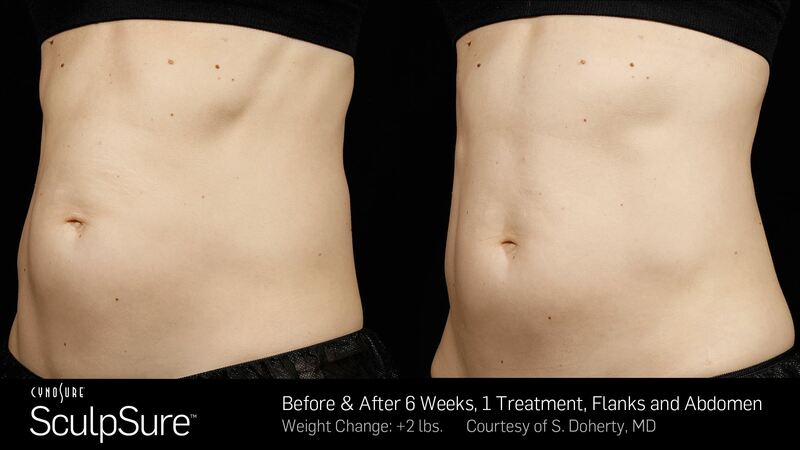 The final results of SculpSure treatment are visible after three to four months. Multiple sessions (usually two to three) are recommended to achieve the optimal fat reduction for your needs and goals. Body contouring requires customization to ensure each patient receives the best possible results. The price of SculpSure, therefore, will vary based on the unique details of your treatment plan. Call us for the latest prices and amazing package deals. Say goodbye to unwanted fat on those trouble spots! Contact our practice today to schedule a consultation and find out if SculpSure is right for you.